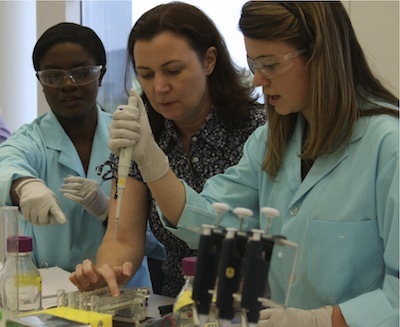 The HudsonAlpha BioTrain Internship program offers students the opportunity to connect classwork with real‐world job experience and gain skills and knowledge that will prepare them for careers in biotechnology and related fields. The Summer 2019 application will be open January 15 – February 15, 2019. All applicants will be notified of status via email or phone by March 18, 2019. Summer positions are available for undergraduate through master’s level graduate students, providing experiences that range from in‐depth laboratory research to biotechnology marketing, communications and business strategy. Internships are offered through HudsonAlpha’s nonprofit research labs, educational, economic development and communications departments as well as many of the associate companies. BioTrain interns gain skills and knowledge that prepare them for the workforce as well as related higher education coursework. Simultaneously, interns improve their professional skills through weekly lunch seminars that focus on learning to work in a professional setting and dealing with workplace values such as punctuality, respect, and time management. The addition of the professional development and support networks created in BioTrain separate an internship with HudsonAlpha from other laboratory experiences. The program accepts 25 to 30 interns into BioTrain each summer. Interns work from 10 to 30 hours per week, depending upon the position. Interns are paid a stipend and participate in professional development sessions each week of the program. For the culmination of the internship program, students create and present posters that explain the work they accomplished during their internship at the Institute. Each internship opportunity is crafted with specific skill sets in mind and will be open to participants based on their educational level and area of concentration. After a completed application is received, the information will be reviewed and the applicants selected for internships will be notified. The selected interns will be required to attend a one-week, full-time Biotech Boot Camp at HudsonAlpha the first week of the internship period. The internship program typically runs for nine weeks, during the months of June and July. The 2019 BioTrain Internship Program will run from May 28 – July 26, 2019. Interns are required to attend the entire session. It is expected that you will not undertake other organized activities that conflict with the times of this appointment. Participation in summer courses will need to be coordinated with the intern’s direct supervisor. Applications for the 2019 BioTrain Internship program will open on January 15, 2019. Thank you for your interest.